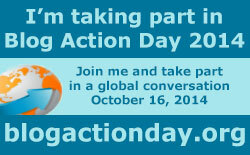 Today is Blog Action Day, and I’ve registered to write a post about inequality. I don’t know whether I just like to register to take part in something which is really worth it or it is only that I am not really aware of the little time I usually have to reflect on anything apart from my life as part of my little family or as a teacher. I don’t even remember when was the last time I went out for a run. And it is thus that I believe that one of the forms of inequality that affects us nowadays is the lack of time to do what makes us feel good, free and happy. Why is it that you listen to some people who can go to their Aikido classes, to the gym or to the theatre when you can’t? What have I done to not be like those people? We all have 24 hours in a day, so I must be doing something wrong. I’ve always been a slow, thorough kind of person. Does that make me different? Yes, I guess. That might be a reason why I don’t find time for some other activities… If I spent a long time sitting at my desk, preparing my lessons, uploading new materials and resources for my students, and that takes the better part of the evening I shouldn’t complain about inequality. I am not being alike many other people who will finish those things before and will devote their time to something else. What I can do is to start at myself. Reflect on what I do and I don’t and take the necessary steps not to feel unlike any other people, because there may be a good side of inequality after all and we should be able to find it.